2017 Lowe SF234 Sport Fish For serious anglers craving tons of space and huge value to match, the Lowe Sport Fish 234 offers premium amenities and great versatility, all in a comfortable, stylish pontoon. With ample storage and capacity for up to 14, you can invite your fishing buddies and all their gear. 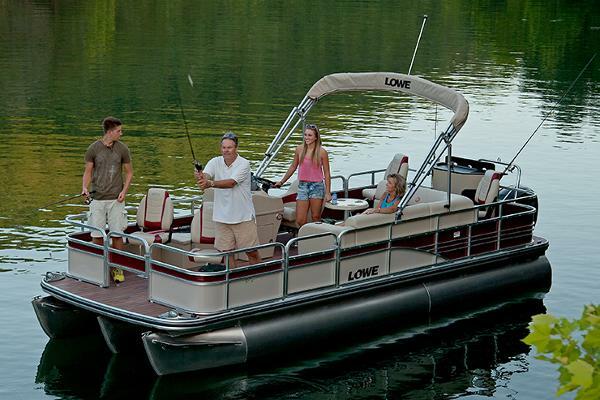 Ride in comfort, fish in style, with the Lowe SF 234. Please note: This boat model may or may not be in-stock. A Nationally Advertised Price, if listed, may change without notice or include accessories not fully described herein. Please contact your local, authorized dealer for exact details on model availability and package pricing. 2016 Lowe SF234 Sport Fish For serious anglers craving tons of space and huge value to match, the Lowe Sport Fish 234 offers premium amenities and great versatility, all in a comfortable, stylish pontoon. With ample storage and capacity for up to 14, you can invite your fishing buddies and all their gear. 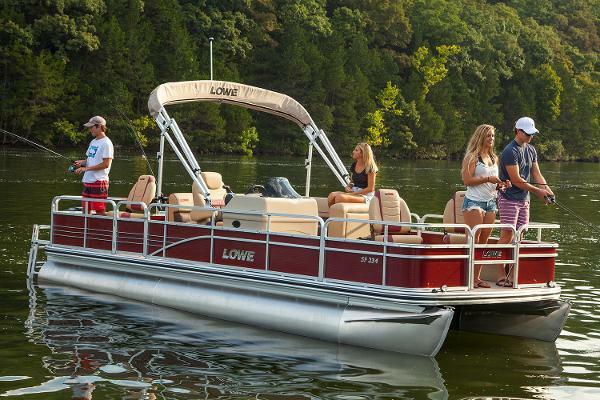 Ride in comfort, fish in style, with the Lowe SF 234. Please note: This boat model may or may not be in-stock. A Nationally Advertised Price, if listed, may change without notice or include accessories not fully described herein. Please contact your local, authorized dealer for exact details on model availability and package pricing. 2017 Lowe SF234 Sport Fish Additional Options: Custom Reclining Helm Seat w/Slider, Docking Lights, Custom Fit Snap On Cover, Full Vinyl Flooring, Hydraulic Steering, Pop Up Privacy Curtain, Ski Tow Bar, XL Tritoon Package. Color- Blue For serious anglers craving tons of space and huge value to match, the Lowe Sport Fish 234 offers premium amenities and great versatility, all in a comfortable, stylish pontoon. With ample storage and capacity for up to 14, you can invite your fishing buddies and all their gear. 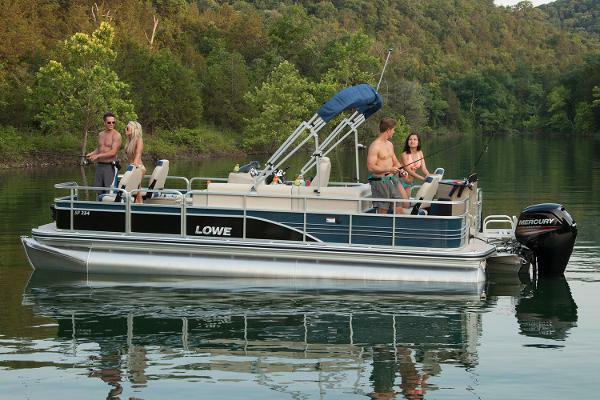 Ride in comfort, fish in style, with the Lowe SF 234. Please note: This boat model may or may not be in-stock. A Nationally Advertised Price, if listed, may change without notice or include accessories not fully described herein. Please contact your local, authorized dealer for exact details on model availability and package pricing. 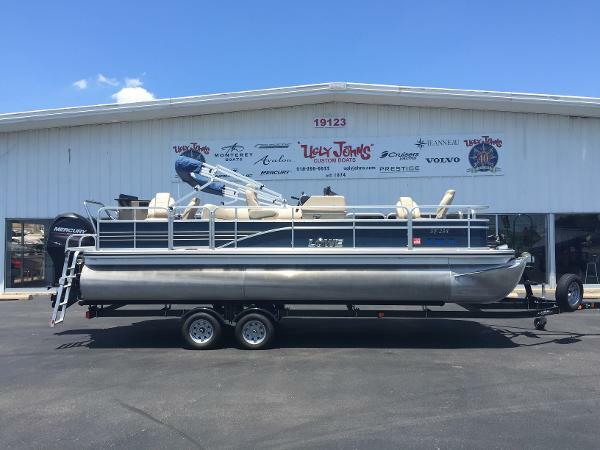 2014 Lowe SF234 Sport Fish Have you been looking for a clean, used pontoon boat? Take a look at this 2014 Lowe SF234. This is a one-owner boat in really good condition with plenty of horsepower to ski & tube behind. Call or stop by Ugly John's Catoosa location east of Tulsa to take a look at our great selection! Financing & delivery available! 2015 Lowe SF234 Sport Fish This boat model may or may not be in-stock. Please contact your local, authorized dealer for more information For serious anglers, the Lowe SF234 offers premium amenities, great versatility and excellent value, all in a comfortable, spacious pontoon. With ample storage and capacity for 13, you can invite your fishing buddies and all their gear. Ride in comfort, fish in style. Features include: 25” diameter high-buoyancy pontoon logs w/ full-width cross members and full keelCapacity for 13 family members or fishing buddiesFiberglass reinforced acrylic console w/ tach, speed, fuel & trim gaugesBarrel helm seat w/ swivel & slider4 pedestal fishing seats, bow and aftJensen® MS30 Bluetooth-ready AM/FM stereo w/ speakers13-gallon aerated livewell located in the bow area3 angled stern rod holders with cup holdersRound pedestal table w/ 2 cup holdersStern entry w/ heavy-duty boarding ladderHeavy-duty 9' Bimini top in choice of 3 colorsOPTIONAL FISHING FEATURES: Fish Station w/ livewell; MotorGuide® or MinnKota™ trolling motor; Lowrance Elite or Mark-5x fishfinder Lowe factory packaged boats are available with various horsepower Mercury® outboards. Standard equipment and options may vary from model to model.